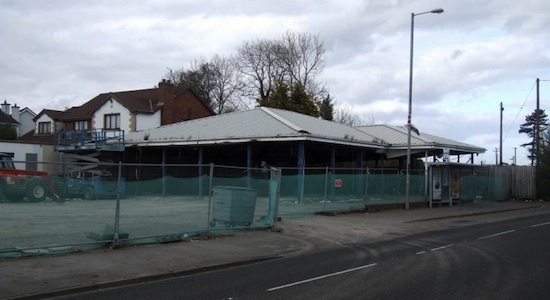 This page contains an archive of updates about progress on this scheme up to 7 April 2014. More recent updates can be found here. 7 Apr 2014: This update is to bring you nine photographs that were taken by Owen Fulton on 31 March - thank you! In my previous update below I got slightly ahead of myself in terms of the progress on the new northbound carriageway, apologies! What we can say is that the kerbing and street lighting seems to be in place for the new northbound carriageway from the south end of the scheme at Jordanstown to around Neill's Lane although traffic is not yet using it. At the main Station Road junction the road widening seems to be completed, but the roundabout is not yet in place. This junction will apparently be closed for two weeks at the end of April, which may be to facilitate works of this nature. This will cause disruption as there is no other way out of Greenisland village onto the Shore Road without going on a several mile detour. I haven't got many photographs of the 'offline' section at the northern end of the scheme, as it's hard to get a vantage point, but I'm told that some of the kerbing is now in place. The bridge that will carry Whinfield Lane over the new dual-carriageway now has one both of its beams in place. 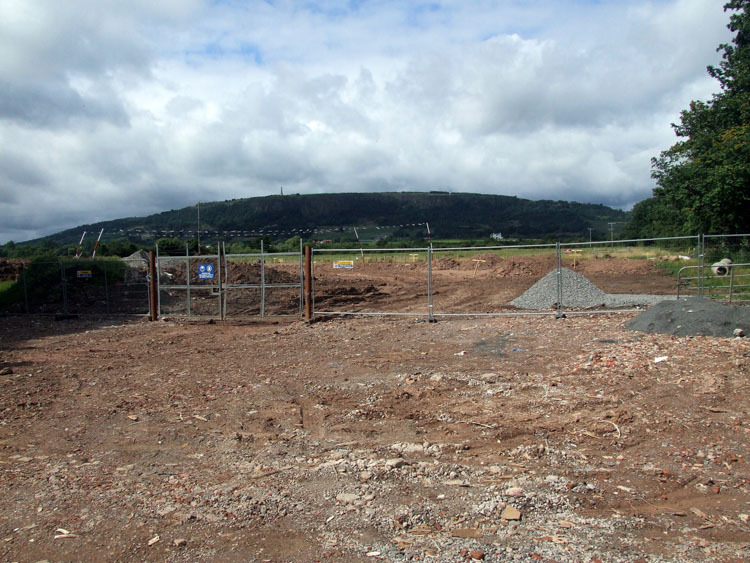 The photographs below are arranged in order from south to north, starting at the Jordanstown end of the scheme. In most cases I've also linked to a Google Streetview of the same view before work began. 25 Mar 2014: Unfortunately I haven't got any recent photos of this scheme, but work appears to have progressed very well over the past four months. The original schedule said that the northbound carriageway would be constructed first, being completed during the spring of 2014. 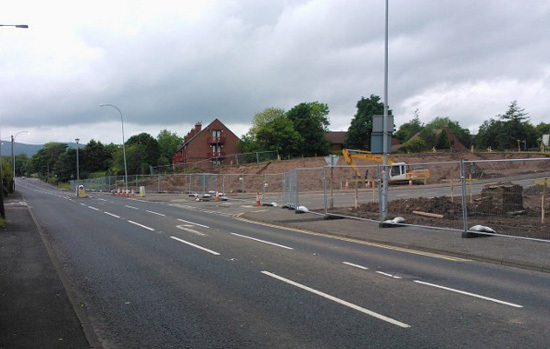 As expected, the northbound carriageway is indeed taking shape and traffic has been diverted onto it in at least two locations temporary sections of tarmac to facilitate this - at Shorelands and at Station Road in the middle of Greenisland. I hope to get some photos during April. With thanks to Andrew McKeever and Andy Boal for information for this update. 8 Dec 2013: These photos were taken just under a week ago by by Owen Fulton (many thanks!) and show progress on the new road. A lot of work has taken place on retaining walls since the last update. As anticipated in the previous update, the concrete retaining walls do indeed seem to be being faced with stone for aesthetic appeal. 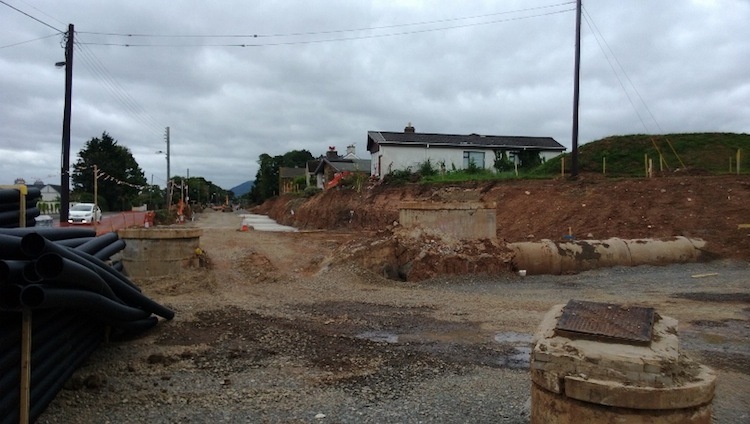 Since so much work is going on on retaining structures at the minute, it seems likely that the contractor will be in a position to start constructing the actual future northbound carriageway soon. The timetable given at project commencement said that the northbound carriageway would be completed by "summer 2014". In a few places traffic has now been diverted wholly or partly off the current road and onto widened sections, which may be the start of this (see pic 1). 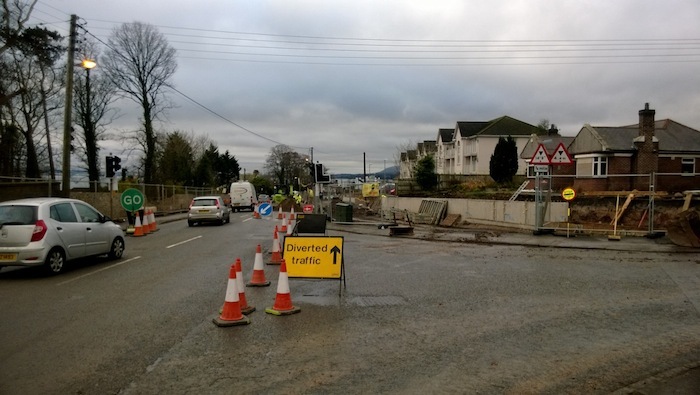 Drivers should exercise caution going through the works due to the changing nature of the site - there were a couple of incidents at the entrance to the University of Ulster campus last week. 28 Oct 2013: These photos were part of 8 taken by 'GreenislandRoads' on 5 October and uploaded to his photostream. Due to family illnesses I have only now got a chance to stick these up. So please bear in mind that they show progress as it was three weeks ago, and work is likely advanced further since then. As before, these start at the Belfast end of the scheme and move towards Greenisland. 22 Sep 2013: This update is to bring you some new photos taken just under a week ago by Owen Fulton. 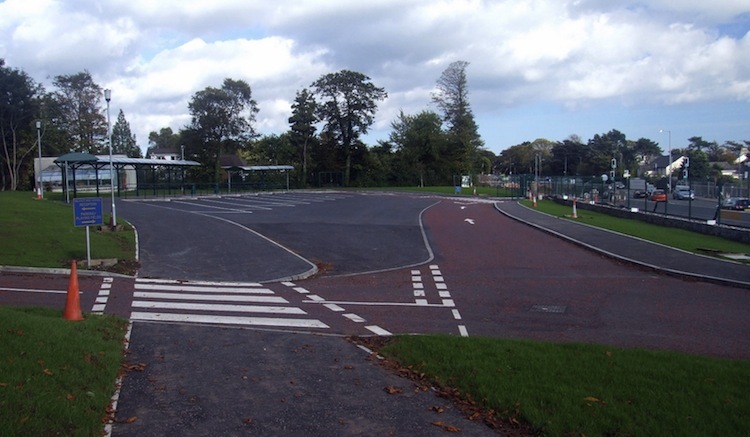 The roundabout at the University of Ulster entrance is "completed" in the sense that the road base has been built, surfaced and the central island mostly put in place. 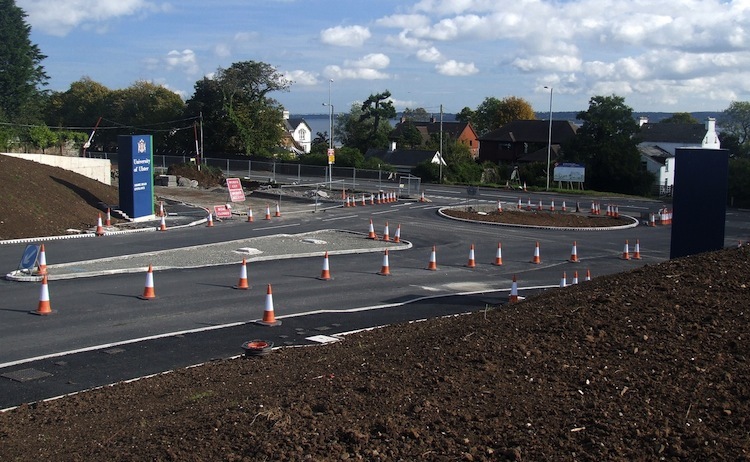 However the existing Shore Road still passes through one side of it, so it's not yet functioning as a roundabout and is instead being treated as a conventional T-junction (see pic 1). The new entrance to Belfast High School was successfully completed in time for the new term (see pic 3). Now that earthworks on the online section seem to be largely done, work currently seems to focus on installing new boundary walls, retaining walls etc (see pics 2, 4, 7), although there are some very obvious service diversions that still need done (see pic 6). To their credit, the contractor has also been attaching window art to the windows and doors of the many derelict homes along the site (see pic 5) which gives them the impression of being happy, occupied homes and lifts the whole mood of the site. A nice touch. 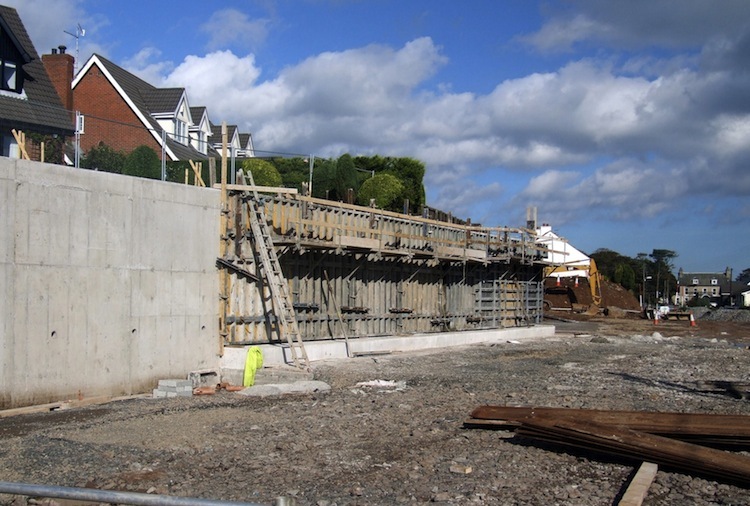 The photographs below were all taken between Jordanstown and Greenisland and are arranged in order starting at the Belfast end of the scheme. 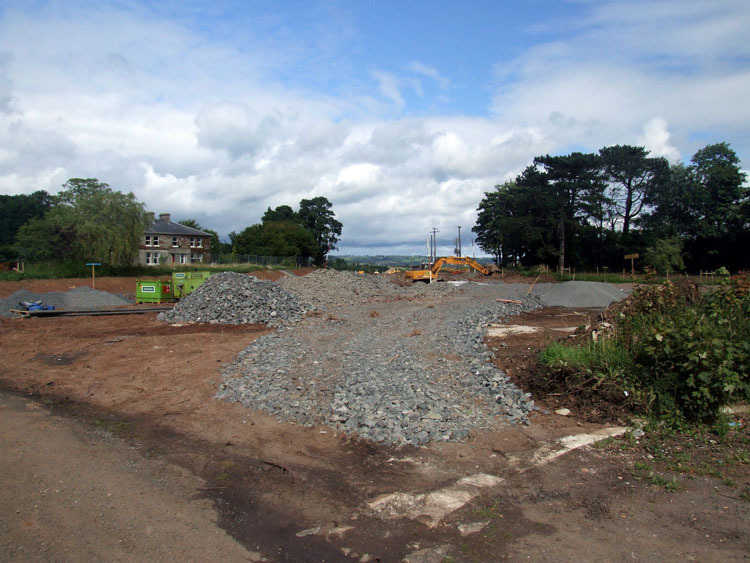 4 Sep 2013: An extra update to bring you two more pictures, this time of the works at the University of Ulster at Jordanstown entrance onto the Shore Road (map). They are used with permission from 'GreenislandRoads' who has shared these plus 10 more taken at the same location on or around 31 August over on his photostream. The entrance has been closed for the whole summer to allow for major earthworks. 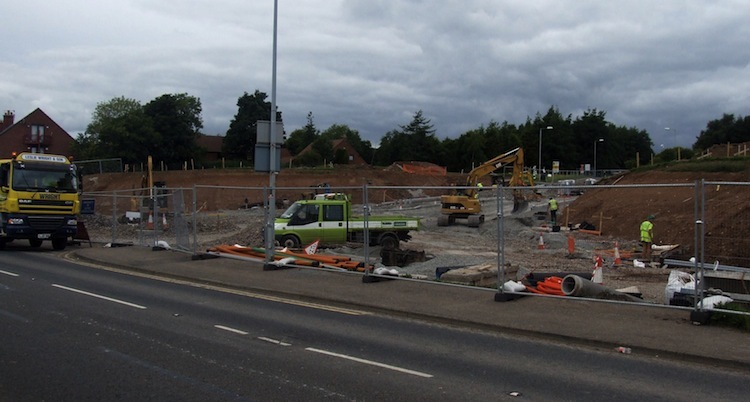 These involve digging out a large area of the land at the entrance to make way for the future roundabout. 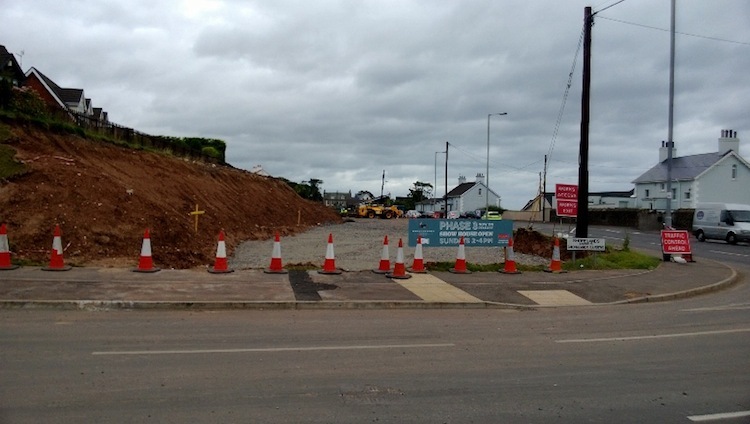 It's unclear whether an actual roundabout will be constructed prior to the entrance opening again in time for the new university term at the beginning of October, or whether it will be limited to the earthworks. As you can see, parts of the excavated land are being finished off with slopes, and parts with retaining walls. 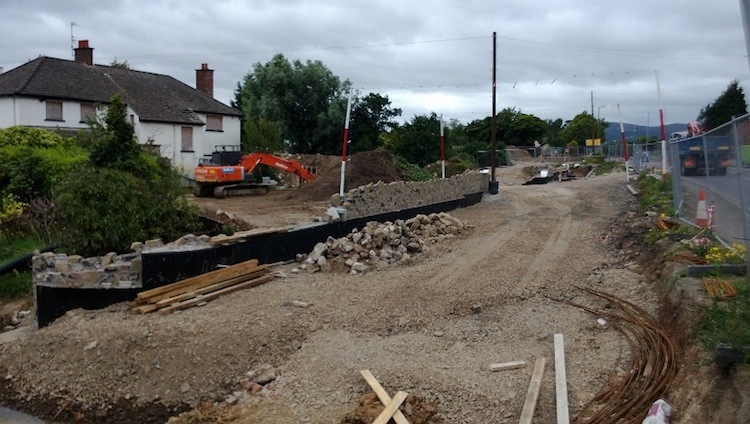 21 Aug 2013: Construction has now been underway for a little over 4 months, and already the route of the future road is very obvious from ground level. With site clearance work now basically done, work over the past couple of months has focused on preparing the foundations on the land that has been cleared. 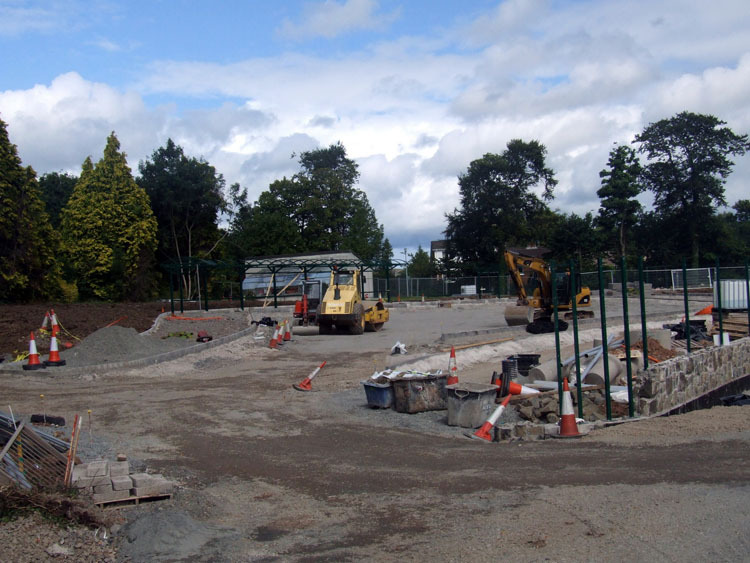 However, during July and August there has been a particular focus on the University of Ulster entrance, and the Belfast High School entrance, both of which are being reconstructed in earnest during the time that the two institutions do not have students. The seven images below are all used with permission from 'GreenislandRoads' who is sharing these along with a few others I have not reproduced over on his photostream. My grateful thanks to him. The pictures are arranged in order starting at the Belfast end of the scheme and heading towards Carrickfergus. (Last month I widened the pages on the site, so these are the first images at the new, larger size - enjoy). 2 Jul 2013: A quick update just to make you aware of this Flickr set of images, taken 2 or 3 days ago by @ppdoddy. The first 6 are a nice sequence of before and after picture pairs taken at (roughly) the same location two weeks apart. The images show the progress that continues to happen in absorbing the land that has been vested from adjacent properties into the site. 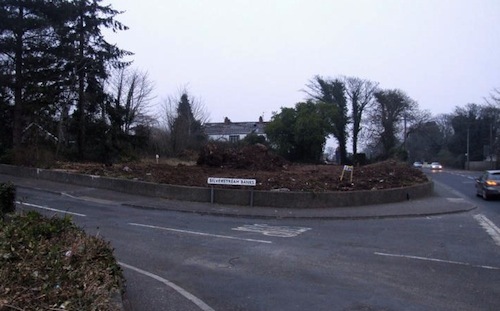 Some of the images show houses that are clearly not inhabited, but yet have not been demolished. These are properties are probably ones that were either purchased under blight legislation and boarded up, or have been recently vested and have been sealed temporarily, but which will eventually be re-sold (at reduced price) once the scheme is completed. It is my understanding that all properties that were to be demolished have now been demolished. With thanks to @ppdoddy for taking the time to share these images. 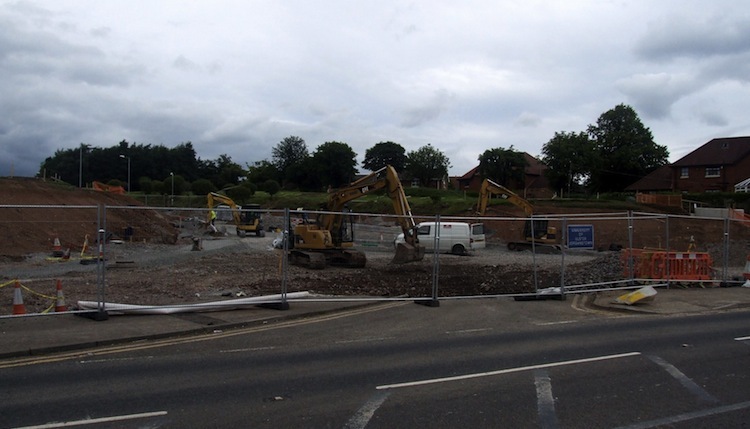 23 Jun 2013: Progress on the scheme has been good over the past month. 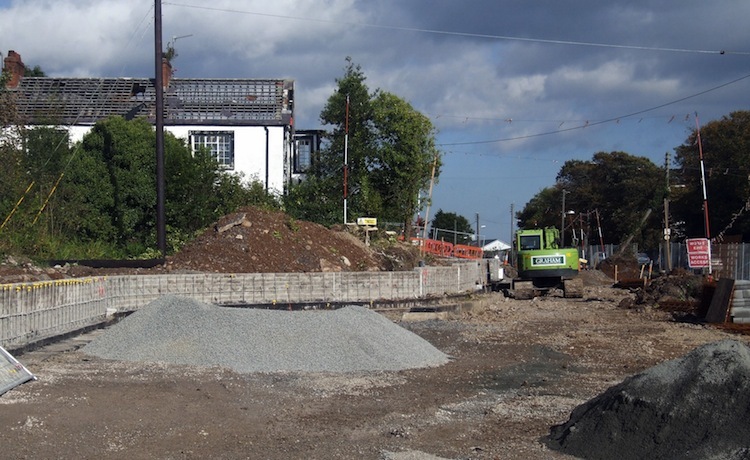 All property demolition seems to be completed, and actual earthworks are well advanced. Now that the spring term is over, the University of Ulster entrance, which will be converted from a priority T-junction to signalised roundabout, has been closed and will remain so until around September. You can see this in the first of the photos below, which are provided thanks to a contributor who wishes to remain anonymous. The rest of the images follow a progression from the Belfast end of the scheme to the Carrick end of the scheme. Pic 1: The entrance to the University of Ulster which has been closed so that the earthworks for the future signalised roundabout can take place. 18 June 2013 [Anonymous visitor]. 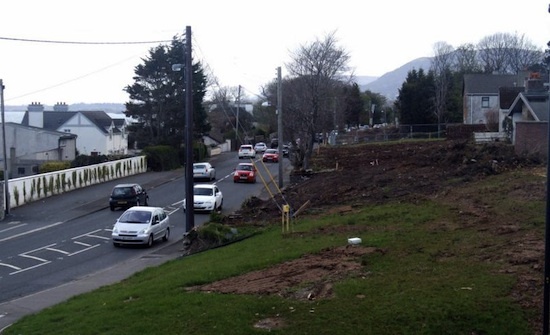 Pic 2: All the vegetation and land clearance at Silverstream Banks are now complete. This is the same view before work began. 18 June 2013 [Anonymous visitor]. Pic 3: The view north-east from Castle Lug, a medieval tower house just before Greenisland with vegetation removed. These houses will remain. 18 June 2013 [Anonymous visitor]. 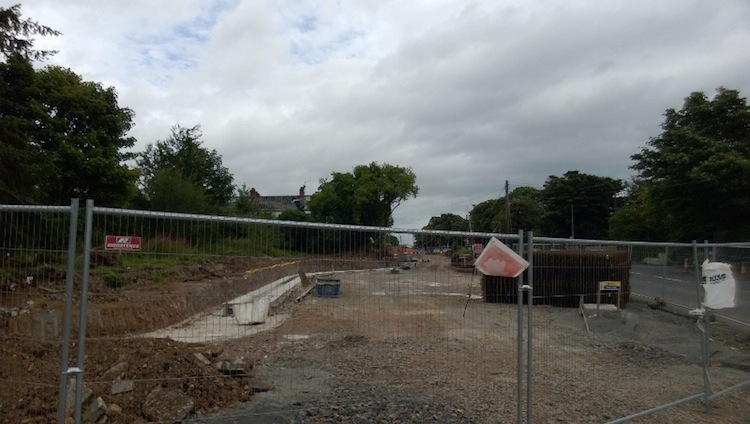 Pic 4: The view south-west, towards Belfast, from Station Road in Greenisland with site clearance work well underway. This is the same view before work began. 18 June 2013 [Anonymous visitor]. 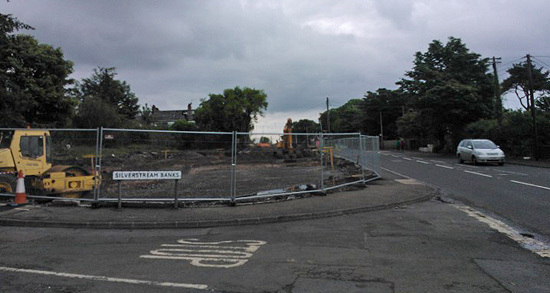 Pic 5: Turning the other way and stepping onto the ground where the Spar shop used to be, this is the view north east. This is where the new road heads off inland away from the existing Shore Road. This is roughly the same view before work began. 18 June 2013 [Anonymous visitor]. Pic 6: The new offline dual-carriageway will cross Whinfield Lane, seen here looking south east. 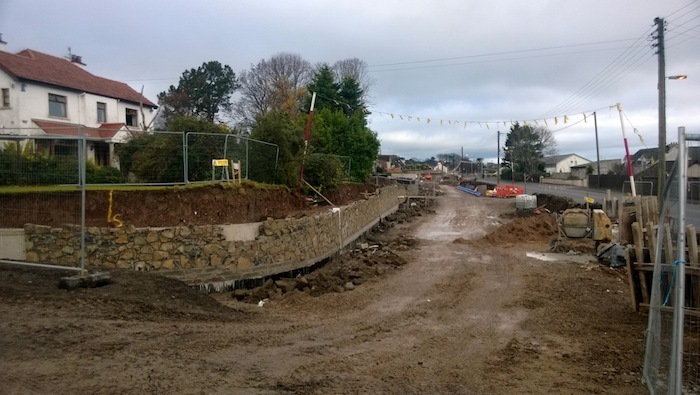 The lane will be raised up on an embankment and be bridged over the new road. 18 June 2013 [Anonymous visitor]. 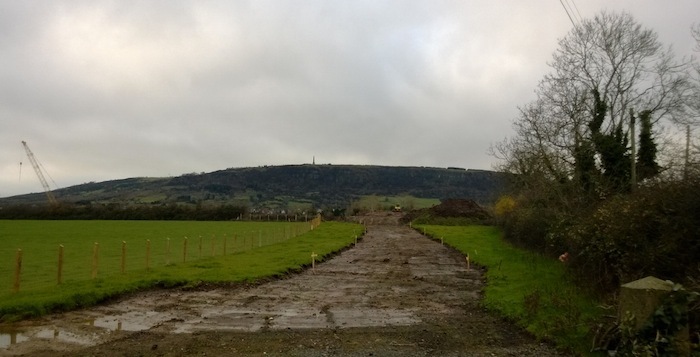 Pic 7: View south-west (towards Belfast) from Whinfield Lane showing the route of the new dual-carriageway taking shape on the right in the form of wooden fence posts. This is the same view before work began. 18 June 2013 [Anonymous visitor]. Pic 8: Turning 180° from the previous image, this is the view north-east (towards Carrickfergus) from Whinfield Lane showing the route of the new dual-carriageway taking shape on the left. This is the same view before work began. 18 June 2013 [Anonymous visitor]. 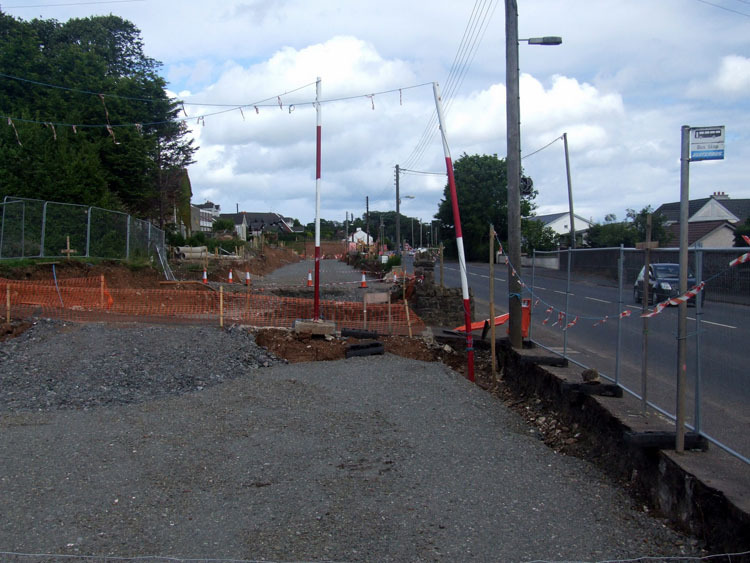 8 May 2013: Three more photos this time, again taken with permission from 'GreenislandRoads' who is sharing these and future photographs of the works on his photostream. The pictures were taken on 30th April, although I have only just got a chance to update the page. Demolition work seems to be progressing very well, with probably the majority of houses slated for demolition now gone and much vegetation clearance also completed. 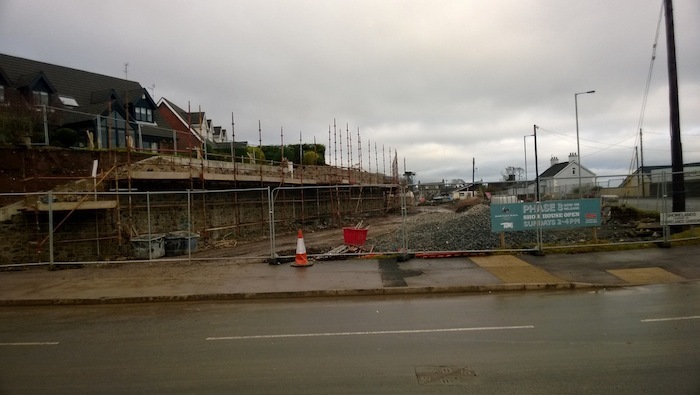 The well-known Spar shop in Greenisland was almost gone when the picture was taken, while the adjacent house was a pile of rubble at that point. I am also led to believe that at least some of the building rubble from the demolition is being recycled to be used as fill for the construction of the new road. That will provide an interesting challenge for interpretive archaeologists in 300 years' time! 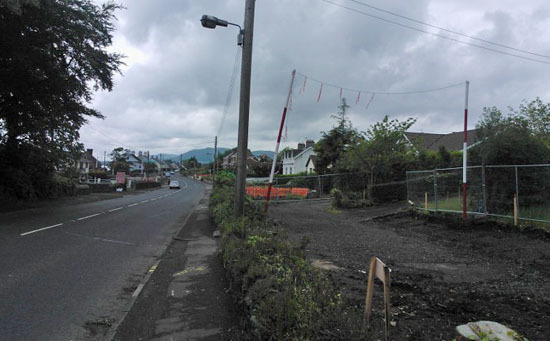 15 Apr 2013: With work underway now for about six weeks, the nature of the work has become very obvious to road users. At this stage work is focused on site clearance. For example, most of the trees at the entrance to Belfast High School have now been felled. 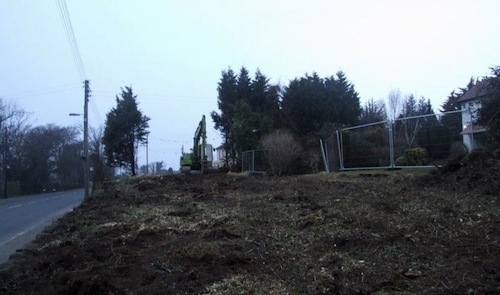 Many hedges and boundaries have also been removed, revealing the once-hidden houses behind. Many of these were apparently unoccupied and boarded up, having been purchased by the DRD under blight legislation over many years, but screened from public view by trees and hedges. 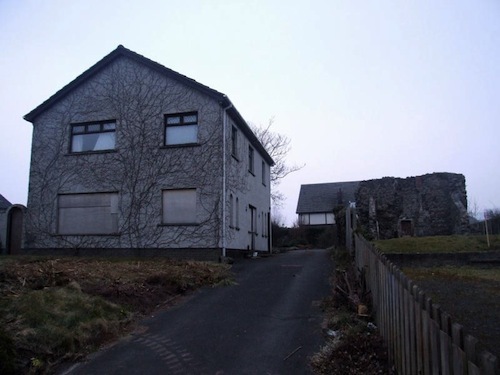 Work has now begun on demolishing these houses, and I include a selection of images below with permission from 'GreenislandRoads' who is sharing these and future photographs of the works on his photostream. There is something quite sad and haunting about these images. 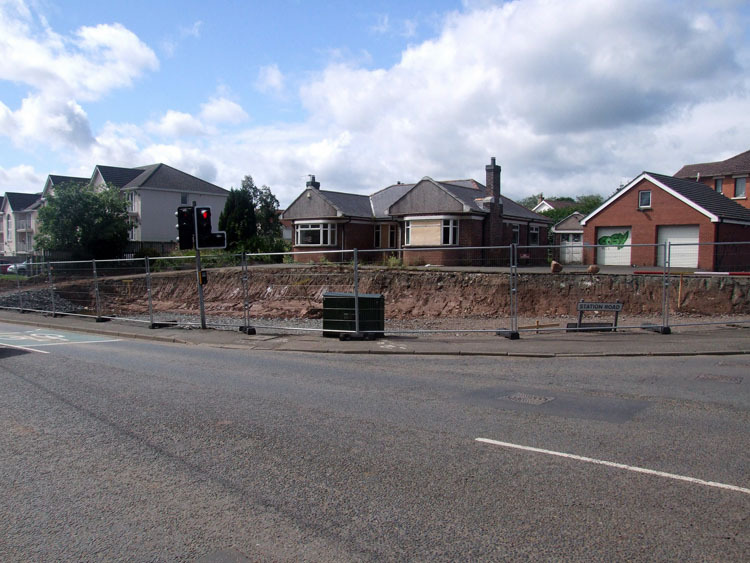 Work has also now got underway to demolish the well-known Spar shop in Greenisland and the adjacent house, which were very much in the way of the road! As you can see, the plan seems to be to complete the northbound carriageway first. 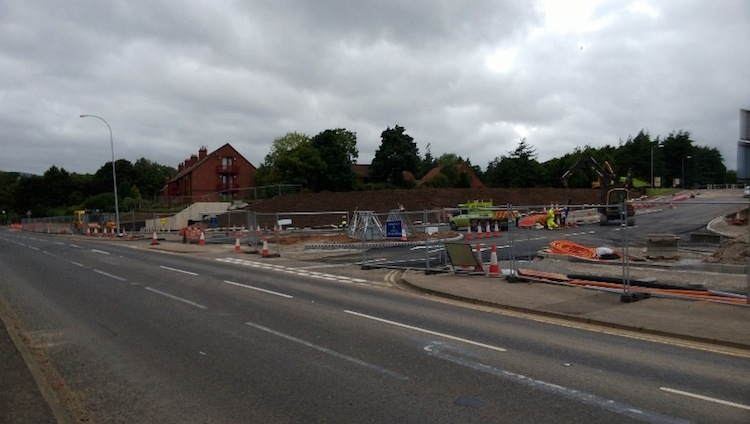 Since the current road sits partly on top of the site of the future northbound carriageway, this is going to mean some strange bends and curves as time goes on to allow traffic to weave and thread its way around the various parts of the work site. The southbound work that follows ought to be simpler as all current traffic will then be able to be accommodated on the completed northbound carriageway. 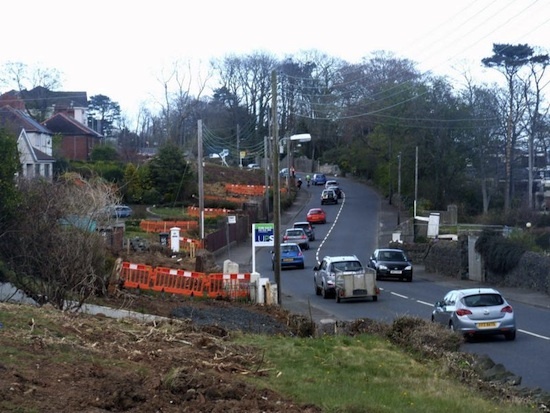 Work on the offline section of road between Greenisland and Seapark will have much less impact on traffic as it does not affect the existing road except at either end. In other news , some tree felling was reported in the vicinity of Belfast High School on Friday. With thanks to Andrew McKeever for the above. It has to be said that the contractor has gone very far in setting up a dedicated web site, e-mail address and phone number for those with questions or concerns about the scheme. Great to see. 3 Mar 2013: Work is due to get underway on this scheme on Tuesday, 5th March 2013. On the day prior to this, Monday 4th March, Roads Service have organised a public meeting at the Clarion Hotel, Carrickfergus from 7pm-9pm. This is presumably to get residents and road users up to speed on what is about to happen. They have also released an information leaflet for the same purpose, available here. The leaflet includes a commitment to road users that the road will have one lane open in each direction (as it does now) between 6am and 8pm on week days. In other words, any road closures will not happen during the working day. The same commitment applies on Saturday 8am-7pm and Sunday 10am-7pm. It will be wonderful to see this scheme finally underway after so many years of waiting. If anyone happens to take photos of the works underway I would love to see them! You can tweet them citing @niroads, or e-mail them to me (see "contact" on left). Roads Service's official web page about the scheme is here. 8 Jan 2013: It is an exciting time for supporters of this scheme - a scheme that has been proposed in one form or another for almost half a century - as we are now only 3 months away from commencement! 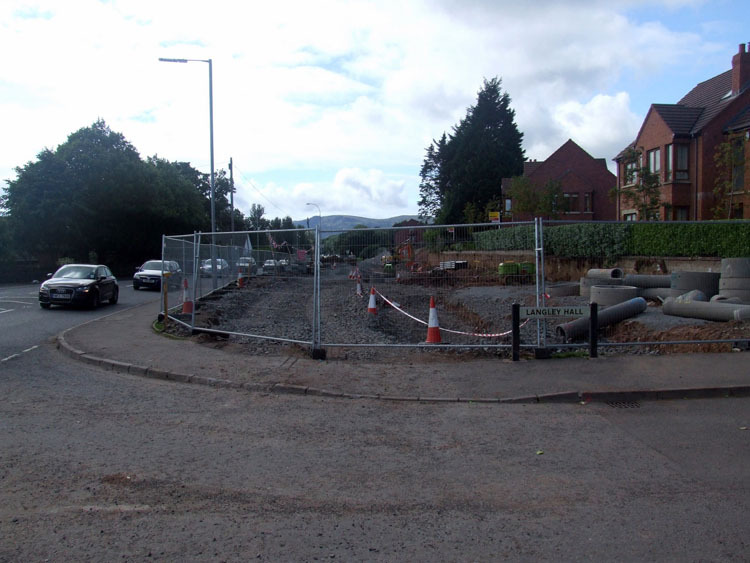 According to this news story in Newtownabbey Today, the DRD has received six tenders for the construction of this scheme. It is expected that the contractor will be appointed on 17 February, ie six weeks from now. The news story also says that the work is due to get underway "two months later", which would be April. There will need to be a "mobilisation" period while the contractor comes on site, sets up site yards etc, so we could expect to see major work taking place by the summer. The same news article stresses local concerns about congestion during the works. However, given that the road is currently one lane each way, and will remain so at busy times throughout the works, there is little scope for things to get much worse. 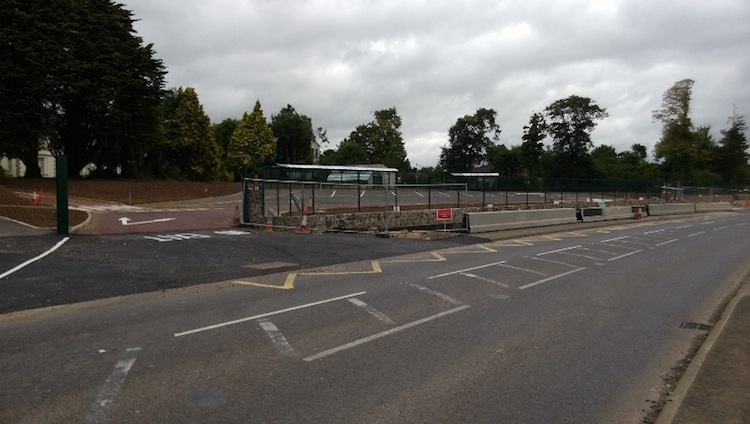 Nevertheless, the "Roads" Minister has taken the wise precaution of making the St Bride's park-and-ride/share car park at Carrickfergus free of charge from yesterday until the scheme is completed in the summer of 2015. This will make it cheaper to get the train into Belfast or car share, so is a welcome measure. In fact, given the importance that is now placed on encouraging alternative forms of transport, one could argue that all park-and-ride sites should be free of charge. 24 Oct 2012: The BBC is reporting today that the Vesting Order for this scheme has been, or is about to be, published, although this has not appeared on the DRD web site. The Vesting Order is the legal document that is required to compel landowners to sell the property needed for the scheme to the DRD. 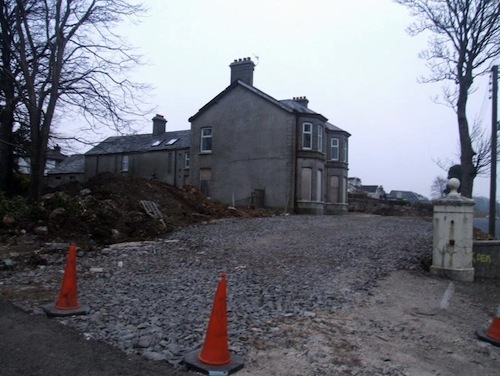 Quite a few properties have already been acquired under "blight" legislation, which requires the DRD to purchase a property if the owner cannot sell it due to a planned future road scheme. In the update of 5 June 2011 (below) I reported how 25 properties had by then been purchased under blight legislation, and that the remaining properties that will be acquired via the Vesting Order were then worth around £17m. The Vesting Order is published late on in the planning process as it requires the DRD to actually have the necessary cash, which was only made available in February of this year. The construction contract is due to be awarded in February, with work to get underway in earnest by June 2013. 30 July 2012: According to an internal memo from last February which has been published on the DRD web site, the timetable for the procurement process is as follows. Tender documents issued 11 June; Tenders returned by 5 Nov 2012; Award decision issued 8 Feb 2013; Award contract 17 Feb 2013. It also clarifies that the £57m budget will be spent £3m 2012/13 financial year; £25m 2013/14; £25m 2014/15 and £4m 2015/16. The current anticipated completion date is "end June 2015". However, the document does refer to a 4 month "mobilisation" period before construction begins, presumably meaning the period for the contractor to bring their resources to bear on the project, setting up site yards, etc. Thus intensive work on the ground would likely not begin until June 2013. 24 Jun 2012: Stage one of the procurement process should now be complete (see previous update). According to the EU tender notice, the shortlisted contractors were sent invitations to participate in stage two on 11th June. This second process will see a winning contractor selected, hopefully by the end of 2012, with work scheduled to begin on the ground in early 2013. Although nothing is yet happening on the ground, the wheels of progress on this scheme are greased and are now moving as fast as they can! 13 Mar 2012: Following February's announcement, Roads Service have lost little time putting this scheme out to tender. The tendering process will be done in two stages. The initial stage is just to compile a list of companies that Roads Service are confident could do the work. The second stage will be the formal tender, where one contractor will be selected. The advertisement for the initial stage went live on 1 March, and the selected companies will be notified on 11 June 2012. This will then be followed by the second stage, which ought to see a final contractor selected before the end of 2012, with work to begin on the ground early in 2013. The scheme has already passed its public inquiry and is good to go - it is only the necessity to go through this tendering process that means work can't begin straight away. (This problem does not affect the A5 and A8 schemes since they were done differently, with the contractors appointed during the design stage). 14 Feb 2012: Today saw a major announcement about how the money freed up by Dublin's postponement of money for the A5. Perhaps the least-surprising element is that this scheme will now go ahead. It was within days of going out to tender in January 2011 when it was put on hold. As a relatively cheap scheme (compared to the A5, A6 and A8) it was the most obvious scheme to get the go ahead, and this is what has happened. The scheme has already passed its Public Inquiry (held in 2007), so that is not an obstacle. However the procurement process (to appoint a contractor) has not happened, so this will take some months. This is probably the reason that the scheme is now due to go to ground "early in 2013". 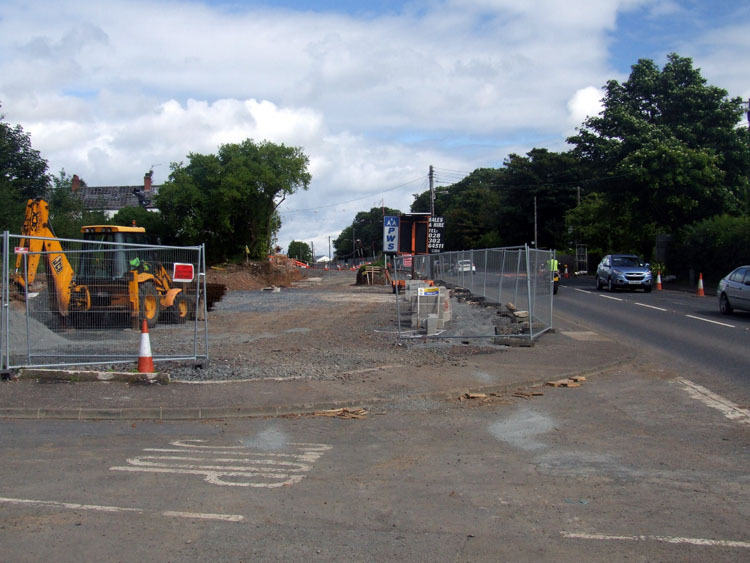 With an estimated timescale of two years, this means that the road could be complete and in use by Spring 2015. The people of Carrickfergus will be celebrating tonight. In terms of cost, the DRD press release gives the cost as vaguely between "£50m-60m", whereas the OFMDFM press release gives it more specifically at £57m. The latter figure is very close to the figure of £55.2m previously quoted by DRD, so I am assuming it is correct. and of course, the big A5 scheme that is now on the long finger. It is therefore the first three of these that I believe have the highest chance of proceeding soon, and thus I would not be surprised if the coming months see movement on the Greenisland scheme. 5 June 2011: This scheme was the subject of an "adjournment debate" in Stormont (the first of the newly elected Assembly) which was held on 30th May. During this various politicians from East Antrim and further afield expressed their dissatisfaction with the sudden halt that was called to this scheme in January. In particular they highlight the problem of blight. 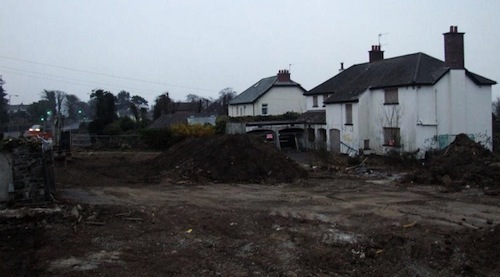 Under blight legislation (designed to prevent people being stuck with an un-sellable house for years and years) Roads Service had already bought 25 properties and some of these have been demolished. During the debate the new "Roads" Minister Danny Kennedy explained in some detail: "Consultations with affected landowners to finalise and agree accommodation works were also substantially completed in 2010. My Department is, therefore, in a position to complete the final statutory vesting order as soon as finance becomes available. 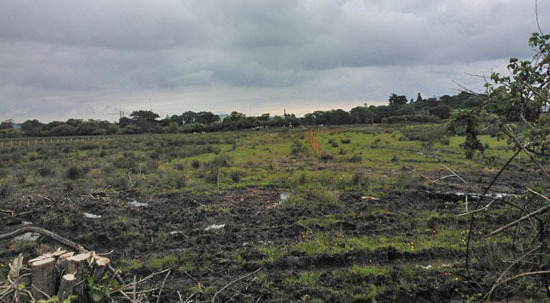 The compulsory purchase of land for the scheme is currently valued at £17 million. My Department’s Road Service has acquired 25 residential properties under blight legislation. A number of those properties have been demolished in order that they do not become derelict and vandalised. Any surplus land or property not required for the scheme will be declared surplus and disposed of on the open market. That is normally carried out upon completion of the scheme. However, my Department’s Road Service is considering early disposal of some properties in order to minimise security and maintenance issues associated with them. In the meantime, every effort is being made to secure and maintain all acquired properties." While the new Minister has committed to reviewing the A5 scheme once the public inquiry has reported, he has not offered any immediate hope for this scheme. All he said was: "Schemes such as the A2 Shore Road tend to take more than one year in construction, and funding in year 5, and possibly beyond, would be required before I could give approval for construction to commence. The funding in those years will not become clearer until further work has been completed to develop the third edition of the investment strategy for Northern Ireland, which, I understand, is due to conclude later this year." So it's a case of "watch this space". 14 May 2011: On Friday the d'Hondt system of sharing Ministries in the newly convened Northern Ireland Assembly resulted in the Department for Regional Development Ministry (which includes roads) falling to the Ulster Unionist Party (previously it was held by Sinn Fein's Conor Murphy). Of relevance to this scheme is that the UUP election manifesto included a committment to "advocate a refocusing on the need to commission the A2 project at Greenisland, rather than the A5 Western Transport Corridor" (UUP 2011 manifesto). This does not mean that there will be an overnight change to the timing of this scheme, but it does suggest that the incoming minister will be more sympathetic to the need for this scheme than the outgoing one. 14 Jan 2011: In a Roads Service Board meeting on 30 November 2010 it was revealed that the initial pre-qualification tender process (which chooses which companies will be allowed to tender for construction) has now been completed. At the same meeting the Board "granted approval for tender documents to be released" which basically meant that the scheme was ready for construction. However, yesterday the DRD (which includes Roads Service) published their budget for the period 2011-2015 and this has revealed that due to lack of money this scheme has now been put on hold, seemingly until at least 2015. This is very sad news for the scheme, given that it has been planned for decades and was probably only months away from commencing. 11 Sep 2010: Roads Service are keeping their cards close to their chest in terms of when this scheme might go ahead (see previous update). However I note that they have just released the initial tender for this scheme. This initial tender is to allow interested engineering firms to bid to be included in the more complicated tender which could be released in a few month's time. This two-stage process ensures that only those firms who have a chance of winning the tender can actually tender for it. This clue suggests that construction may indeed be getting underway in the near future. 21 Jun 2010: Over the past year not much has happened on this scheme. 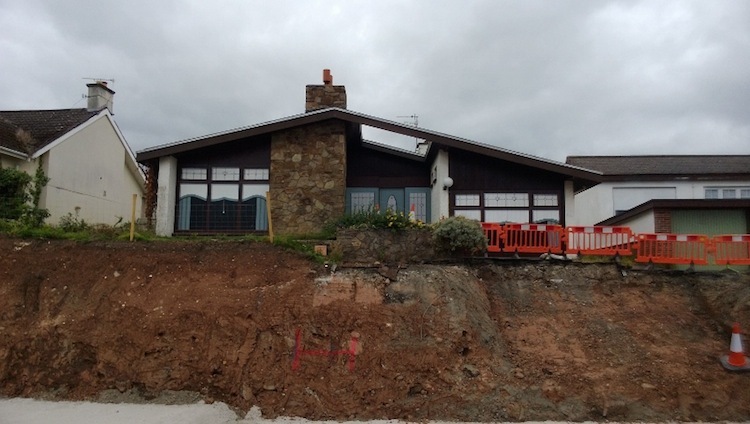 A geotechnical investigation was carried out in 2009 (exploring the type ground the road will be built on) and an archaeological survey began at the end of April, focusing on Castle Lug - the medieval tower house that lies close to the Shore Road. There has been speculation in the media that the scheme is going to be delayed. This has been confirmed to an extend by Roads Service who are now saying merely that "The start date for this scheme will depend upon the availability of funding in future years". This effectively means that Roads Service no longer knows when this scheme will be built. In a debate in the Assembly on 8th June, the DRD Minister said "If the finances are available, delivery is expected to start in 2011-12, and the project should be completed in 2013." However this seems increasingly unlikely to happen as the financial situation deteriorates. 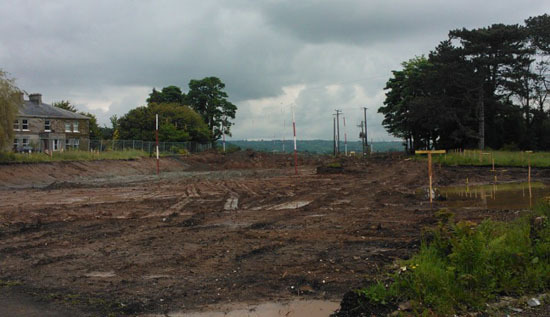 16 Jun 2009: The Regional Development Minister provided an update on this scheme in the Assembly on 5th June. The Geotechnical Investigation (looking at ground conditions on the proposed route) was carried out from January to June 2009. Archaeological work is due to be carried out during the Autumn of 2009. The timescale has not really changed - subject to the availability of funding (not a certainty these days) it is planned to commence in 2010/11 and be completed "by the end of the 2012/13 financial year", ie by April 2013. 24 Nov 2008: The press release issued 7 weeks ago (see previous update) suggested that work would begin in 2010 or 11. 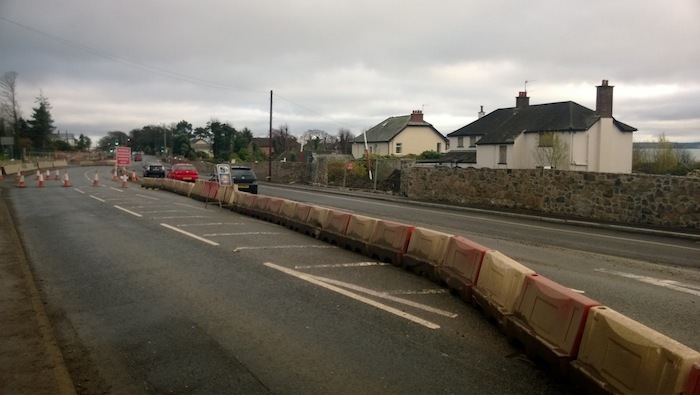 When Roads Service met with Carrickfergus Borough Council on 10 November this was revised to 2011 at the earliest, as reported by The Carrick Times. It quotes a Roads Service spokesperson as saying that "With a fair wind, construction will commence in 2011." and "We are pushing this forward as vigorously as we can; the slow bit has been the statutory procedure, as a result of the objections we received. Schemes compete and are subject to availability of funding, but it is of the highest priority within the eastern division." The vesting order is due to be published during 2009 with the project put out to tender in 2010. This will lead, if there are no problems, to work on the ground commencing in 2011 and lasting about two years. 2 Oct 2008: Roads Service's response to the public inquiry was published on 30th September. It did not say anything earth shattering, and committed to proceeding with the scheme largely as proposed. The documents, available here, outline Roads Service's response to the main concerns of the inspector (of the public inquiry). 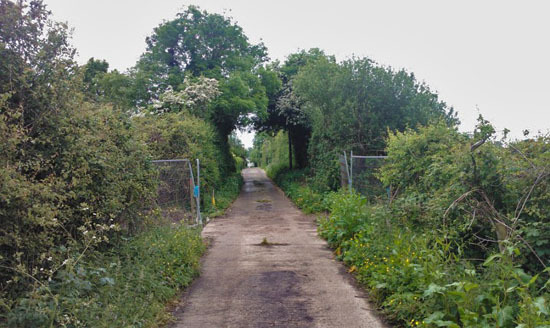 These include a slight realignment at Langley Hall to avoid vesting land from properties that were only constructed very recently and whose location had received approval from Roads Service at the time. It also modifies access to Belfast High School which will now consist of a one-way system accessed to and from the new road directly, and the relocation of the pedestrian crossing. However, a layby on the citybound carriageway has been rejected on the grounds of safety and cost/benefit analysis. The criticism that the "online" nature of part of the scheme would not allow for future road improvements on the road was rejected by Roads Service on the grounds that no specific improvements were currently proposed. This viewpoint is in contrast to the approach taken in the 1970s, when many roads were constructed with additional capacity for future improvements (eg M2 between j4 and j5). The accompanying press release confirmed that work is scheduled to get underway in 2010/11 and last about two years. 22 Sep 2008: According to the Regional Development Minister, the results of the public inquiry into the scheme are expected to be published in October 2008. 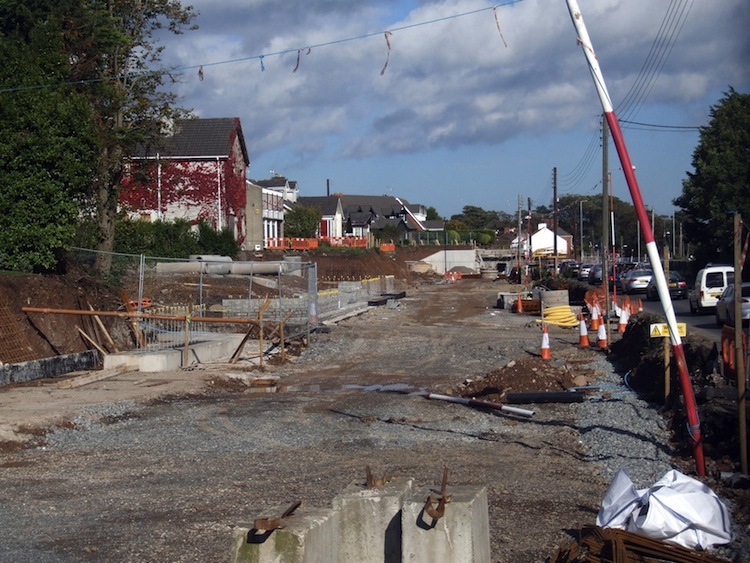 28 Apr 2008: According to the strategy document "Investment Delivery Plan for Roads" of April 2008, the start date for this scheme has been pushed back from 2008/09 to 2010/11 with completion due 2012/13. This delay is probably due to cash shortages caused by the promotion of schemes on the A5 and A6 corridors, but will be disappointing new for Carrickfergus commuters. 17 Nov 2007: In this press release from October 2007, the cost was given as £55.2m. This is another substantial rise in costs. The scheme was included in the Draft Belfast Metropolitan Area Plan in 2004 at an estimated cost of £21m. By March 2006 the cost had been revised and had doubled to £41m. The further rise of about 30% over the past year and a half probably reflects refinements in the design and rises in property values. In the design currently proposed, Greenisland's medieval tower hosue, known as Cloch-na-Larty will survive the scheme but will lose some of the open land in front of it.